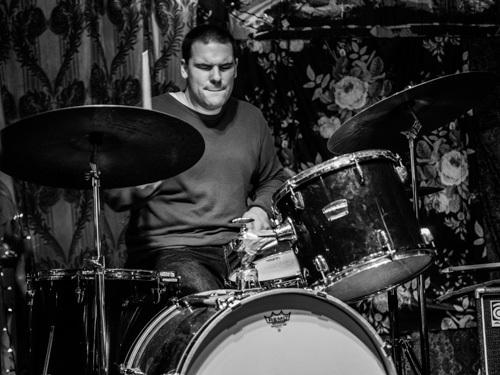 Based out of New York City since 2000, Mike Pride currently performs solo, leads jazz quartet From Bacteria To Boys, the 7-drummer installation Drummer’s Corpse, and the piano trio, I Hate Work. He also co-leads the ensembles Pulverize The Sound (w/ Peter Evans and Tim Dahl) and Period (w/ Charlie Looker and Chuck Bettis). Pride is renowned for his ability to excel in a wide range of genres and ensembles. He has worked with everyone from improvised music icon Anthony Braxton to punk legends Millions Of Dead Cops, toured extensively on four continents, appeared on more than 100 recordings, and toured arenas around the world opening for comedian Amy Schumer with Jason Stein’s Locksmith Isidore. A short list of his collaborators includes Mick Barr, Tim Berne, Boredoms, Eugene Chadbourne, Nels Cline, Andrew D’Angelo, Trevor Dunn, Dynamite Club, Peter Evans, Charles Gayle, Milford Graves, Drew Gress, Mary Halvorson, Curtis Hasselbring, Nona Hendryx, Jon Irabagon, Brad Jones, Haino Keiji, Kirk Knuffke, George Lewis, Frank Lowe, Bill McHenry, Tony Malaby, Sam Mickens, Butch Morris, Joe Morris, William Parker, Marc Ribot, Matana Roberts, Herb Robertson, Jamie Saft, Sonny Simmons, Craig Wedren, Nate Wooley, Otomo Yoshihide and John Zorn. Pride’s versatility doesn’t end with his eclectic résumé as a popular sideman and leader/co-leader of many active ensembles spanning the worlds of modern-jazz, avant-rock, noise and death free jazz. He is also a busy educator and clinician, a composer for TV shows, video games, podcasts and websites, and an experienced visual artist.